An external drive is just a hard drive (HDD) or solid-state drive (SSD) that is connected to a computer on the outside rather than on the inside. Some external drives draw power over their data cable, which of course comes from the computer itself, while others may require an AC wall connection to derive power on their own. Internal hard drives can even be converted into external hard drives via what's called a hard drive enclosure. External hard drives come in varying storage capacities, but they all connect to a computer either by USB, FireWire, eSATA, or wirelessly. External hard drives are sometimes called portable hard drives. A flash drive is one common, and very portable, type of external hard drive. Why Would You Use an External Drive? 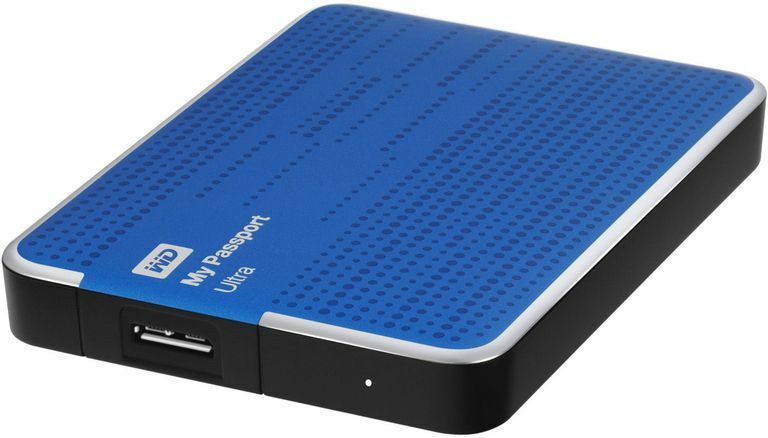 External hard drives are portable, easy to use, and can provide a large amount of storage whenever you need it. You can store the actual device any place you like, and carry a large number of files with you wherever you go. Another advantage of owning an external drive is that you can move them from computer to computer, making them great for sharing large files. Because of their usually large storage capacities (often in the terabytes), external hard drives are often used to store backed up files. It's common to use a backup program to back up things like a music, video, or picture collection to an external drive for safe keeping, separate from the originals in case they're accidentally changed or deleted. Even if not used for backup purposes, external hard drives provide an easy way to expand your existing storage without having to open up your computer, which is especially difficult if using a laptop. If your computer is always giving you low disk space warnings or is sluggish because it's working hard to keep things running on the little bits of free space it has left, it's probably time to get an external hard drive so that you can copy some of your files to it and free up storage on your primary hard drive. External hard drive can also be used to provide additional storage to an entire network (though internal hard drives are usually more common in these scenarios). These kinds of network storage devices can be accessed by numerous users at once and often serve as a way for users to share files within a network to avoid emailing or uploading the data online. Internal hard drives are connected directly to the motherboard, whereas external storage devices first run through the outside of the computer case, and then directly to the motherboard. Operating systems and software installation files are generally installed to internal drives, while external hard drives are used for non-system files, like photos, videos, documents, and files of those types. Internal hard drives draw power from the power supply inside a computer. External hard drives are powered either through their data cable or via dedicated AC power. Data can be compromised much easier if it's stored on an external hard drive because they're generally located on a desk or table, making them very easy to pick up and steal. This is different than an internal hard drive where the entire computer has to be taken, or the hard drive removed from the inside, before someone can have physical access to your files. External hard drives are also generally moved around more than internal ones, causing them to fail more easily due to mechanical damage. SSD based drives, like flash drives, are less prone to this sort of damage. Read What Is a Solid State Drive (SSD)? to learn more about the differences between HDDs and SSDs. See How to Make an Internal Hard Drive External if you need to 'convert' your internal hard drive into an external hard drive. Using an external hard drive is as easy as plugging one end of the data cable into the drive as well as to the matching end on the computer, like the USB port in the case of USB-based external drives. If a power cable is required, it will need to be plugged into a wall outlet. Normally, on most computers, it takes just a few moments before the contents of the external drive will appear on-screen, at which point you can begin moving files to and from the drive. When it comes to the software side of things, you can use an external hard drive in nearly the exact same way as you would an internal one. The only difference is how you access the drive in your operating system. Since most computer systems have just one hard drive that serves as the primary, 'main' drive, it isn't confusing to jump right in to to the hard drive to save files, copy files from one folder to another, delete the data, etc. However, an external hard drive appears as a second hard drive and therefore is accessed in a slightly different manner. In Windows, for example, external drives are listed next to the other devices in Windows Explorer and Disk Management. Just like with internal hard drives, external hard drives come in all shapes and sizes, so they're also available in many different prices. Knowing what kind of external hard drive to buy can get confusing quickly if all you see are rectangles with seemingly random GB and TB numbers. You need to first identify what you'll use the hard drive for. This is referring to both the environment you'll use it in and the stuff you'll put on it. Some external hard drives are built for people who might drop the drive or spill something on it, and others are meant more for sitting on a desk, inside and away from the weather. If you need a versatile external hard drive, look for one that's advertised as rugged or waterproof. Another thing to think about is how much storage space you'll need. If you'll be keeping lots of HD videos on it, you need to get something with a lot more storage capacity than an external drive that'll just be used for hoarding documents for school. Of course, choosing the right external hard drive is very much dependant on what you will use it for. While one person might have a music collection under 100 GB, yours might be 600 GB right now, with no plan in sight to stop download new files. Maybe you even want to use the same drive for your new home movie collection or as a repository for your virtual machines. You have to be mindful of why you need the extra space and what you might put on the drive in the future. It's probably wise to go ahead and get a hard drive that's bigger than what you need right now. So, how do you know what kind of external hard drive you need to buy if you're not sure what you're going to put on it? Start with a disk space analyzer tool to scan your current hard drive to see how much storage space is being occupied by the files you're planning on moving over to the new HDD, and then double that number to be safe. For example, if you find that your massive 600 GB music collection is what you'll use your new drive for, assume it's 1,200 GB and buy yourself a 1–1.5 TB external hard drive. If you think you'll need just 200 GB of storage for your movies, get a drive that can hold 500 GB. Similarly, while you might not need to have a USB 3.0 HDD right away, especially if your current computer doesn't even support that USB standard, it'd be a good idea to get yourself one if you plan to upgrade your computer anytime soon. Preparing ahead of time will save you from having to upgrade to a 3.0 external HDD to take advantage of those speeds.